Robert and his guests provide some incredibly compelling and actionable content geared to help you become a better, more well-rounded real estate investor. Highly recommend listening and subscribing to Real Estate Realities if you want the knowledge AND mindsets to confidently invest in real estate (and inch closer towards financial freedom as a result)! Robert host of Real Estate Realities highlights all aspects of real estate investing in this can’t miss podcast. The host and expert guests offer insightful advice that is helpful to anyone that listens! 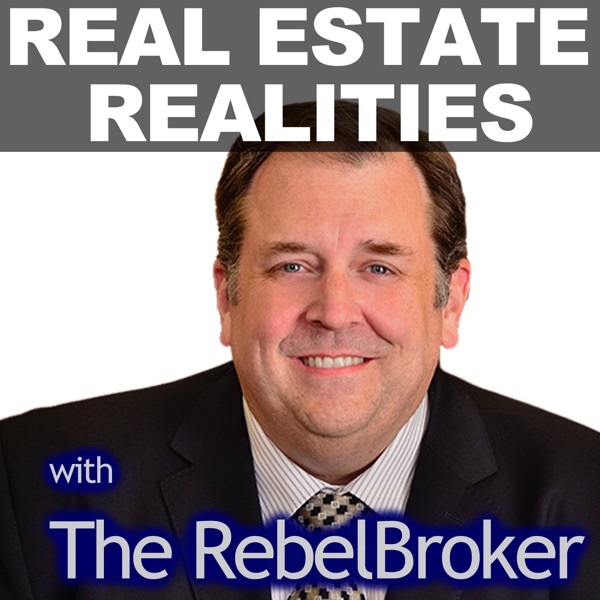 The Real Estate Realities show is a lively, professional and interesting podcast and has the special vibe of its host Robert Whitelaw. I definitely think this podcast is interesting not only for those who involved in the Real Estate business but also for any business man and woman that understand Real Estate is the markets' sensor. Tons of great and valuable information. I really enjoy listen to this podcast... Great Show!! An experienced podcaster who has dialed in his niche and his subject matter. This one will connect with many Realtors with similar experiences and opinions. Great info,but Robert smacks his lips too much and the first 3 minutes of every episode is a waste of time. And I don't care about his home remodel. Good podcast, otherwise. I'm unsubscribing. Close to listening to a mainstream news channel than a focused real estate investment podcast. I am one of the lucky recipients of the $50 Amazon gift cards! I have listened to all of his podcasts. Sometimes I cringe when listening, thinking he is going to have many of his peers angry for disclosing the dark little secrets of real estate. If you want to get educated as a buyer or seller, listen up! Thanks Robert for educating the masses! This podcast is packed with great info to kick your real estate business up a notch! Great way to learn about investing in real estate. Robert is easy to listen to and gives his honest opinion on current issues involving the real estate market. Although I'm a mortgage guy in a completely different market (Nashville) I tremendously enjoy listening to this podcast. I've come across no other that keeps an up to date narrative on happenings in real estate and general lending information. Just great stuff. This guy is a great great. Tells it how it is and translates the latest data for us lazy folks! Excellent. I cannot recommend this podcast enough! Informative, entertaining and engaging. But really makes this show special is the lack of fluff and hype so common in real estate resources. I recommend Robert and this podcast to everyone I know who works in real estate. I love this show! Robert is not only hilarious he speaks on all real estate news topics for the week and shows both sides of the issues, while still trying to be diplomatic about sharing his own opinion of the topics. Love listening on the way into work and getting my real estate 'juices' going for the day! Thank you for all your hard work putting the podcast on a daily basis. Really teaches me a lot🔨 Great show great show!!!! I enjoy that the host spends time on different topics. Especially since the economy and real estate are obviously tied to each other. Also, he’s not constantly trying to sell you his own product(s), which seems to happen a lot on other related podcasts. I'm not an investor or an agent, but I enjoy this podcast. The topics are varied and often present a side of what is happening in the market I would have never considered on my own. Really great content on real estate and high energy coming from the host! I do not think I will go anywhere else to gain the necessary insight and information about real estate anymore. This has it all ! Informative, articulate providing lots of useful information. The speaker also targets newbie investors like me. Do not even consider doing anything in the real estate market without listening to Robert's insight and realities. This podcast is fun and light hearted. Helps take the stress out of what can be a stressful topic. My mom always told me that the best investment was always real estate. True or not true? I want to learn as much as I can about real estate. As a home owner it's a personal interest too. Great show! Keep up the solid info. There are so many great tips in here on how to do Real Estate! Great podcast. Thanks for sharing! Robert provides great insight into real estate and I really enjoy the fact that he focuses on goals. If you don’t know where you want to go, how are you ever going to get there? Great podcast! Great real estate podcast! Keep them coming! Epic postcast Robert, you’re an excellent host and I’m digging the rock solid content. 5 Stars! This is a fantastic podcast. Especially if you are a beginner in the market. Covers so much. Topics that are relevant. Love it!! Great content for all aspects of real estate from buying to selling! I love this real estate game! Great strategies to build your investment business! I have listened for over 6 months now. I like the path the show is now on now. Instead of a once a week long rant over many topic it is now once per day with focus. I love the reality focus of the show. Not hiding items and no hard sales pitches within the show. Definately one to add to your list of shows to listen to. Keep it up and keep on improving! Reminds me daily why I am buying on the NV side of the CA state line. I saved over $6k by having the confidence to shop around for a mortgage then asking the preferred lender front the PMI. Lowered my loan payment by $135/month. He spends half the time talking about completely irrelevant things and making bad jokes. Also, he is not as knowledgeable about real estate as he tries to make himself appear to be. I look forward to this podcast every week cannot get enough rebel broker wish he would do it daily podcast even if he had to charge us for it!!!!! As a real estate agent and a podcaster, I rely on Robert's "real" real estate news. Very few agents in the industry think alike. If you think and behave like Robert you're on the right track. For someone who thinking about becoming a real estate agent, this podcast truly helps see the industry in a wider angle. Robert's experiences and dedication to treat each client with the utmost care and prfessionalism and his view on what truly makes a great Real Estate Agent is a warranted challenge to anyone who calls themselves a Real Estate Agent. Thanks, Robert. Wanted to tell the host ... "Focus!!!" I listened to one podcast and this guy might know his stuff, but I had to wade through 13 minutes of talk that was all about website changes and other unfocused garble. Lost interest after that. This show has gone down hill for the last year. Robert doesn't prepare or bring solid info like he used to. Now he just self promotes and talks about how he is so smart. I like the tone and information at diff angles. Bob has it. At first I did not like this podcast, but then I found myself telling others about what is going on in real estate from what I heard here. Informative and no hidden agenda! There are too many podcasts filled with fluff and very little info (kinda like being at a sales pitch). But this podcast is great and very informative, keep up the good work! Not enough on Real Estate! If you want somebody to reinforce your teaparty-style, right-wing world view, you've found your guy. For those with a more nuanced view of the world who would like to learn more about investing in real estate, this is a frustrating podcast. I think this host has a lot of knowledge to offer, but we don't get to hear it. Was very good clear and to the point. A must hear. Intelligent & Informative - this is a no-hype podcast! This podcast is full of helpful information for buying, selling and investing. I used to be a real estate agent, and Robert really brings to light a lot of the misleading practices that are going on in real estate which most people don't realize. For example his episodes on the amount of time a property has been on the market (and how agents try to conceal this by periodically pulling the listing) and the myth of the "top agent" are so true! He has an easy, casual style which make listening fun.